It’s been a while since Martin Scorsese’s last truly great film, but it’s good to see that the director hasn’t lost his touch, because “The Wolf of Wall Street” is another cinematic triumph that works almost like a companion piece, at least thematically, to earlier movies like “Goodfellas” and “Casino.” But while those crime films were about actual gangsters, “The Wolf of Wall Street” is about a different kind of criminal altogether: a Gordon Gekko-like stockbroker whose own greed and hard-partying lifestyle ultimately led to his downfall. The fact that it’s based on a true story only makes it that much more captivating to watch unfold, and between Leonardo DiCaprio’s brilliant lead performance and Terrence Winter’s excellent script, it’s without a doubt the funniest movie that Scorsese has ever directed. 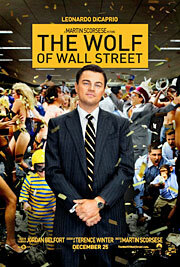 The film opens in 1987 as go-getter Jordan Belfort (DiCaprio) moves to New York City with his wife Teresa (Cristin Milioti) to pursue his dream of working on Wall Street. When the market crashes shortly after starting his new job at a big firm, however, Jordan accepts what appears to be a lowly position selling penny stocks at a strip-mall storefront. But he soon discovers that he can make big bucks selling desperate, blue-collar workers on the promise of instant riches, eventually leaving the company to open his own firm with friend and business partner Donnie Azoff (Jonah Hill). 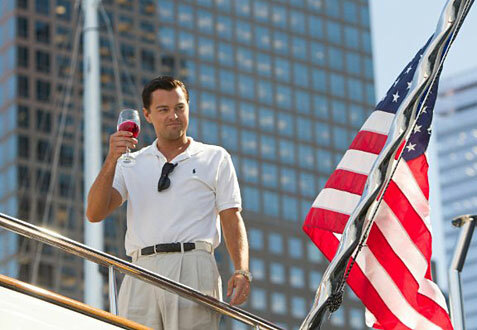 Before long, the newly dubbed Stratton Oakmont is selling those very same penny stocks to the wealthy, turning Jordan and his closest pals into millionaires virtually overnight. Living the high life with a gorgeous new wife (Margot Robbie), more money than he knows what to do with, and enough drugs to tranquilize an entire zoo, Jordan feels invincible – that is, until he catches wind that the FBI has launched an investigation into the firm (and him in particular) for stock market manipulation and other related crimes. Given the nickname The Wolf of Wall Street due to his ruthless business philosophy, Forbes magazine once described Belfort as a “kind of twisted Robin Hood who takes from the rich and gives to himself and his merry band of brokers.” But despite all the pill popping, cocaine snorting, adultery and illegal scheming, Belfort is still an incredibly likeable guy, which is why it’s so important to have someone as charming as Leonardo DiCaprio in the role. You’ve never seen the actor quite like this before, and he’s in top form as the notorious stockbroker, delivering what is arguably his best performance of the five films that he’s made with Scorsese. The rest of the cast is great as well, especially Jonah Hill in another award-worthy turn as Belfort’s right-hand man, up-and-comer Margot Robbie as his second wife, and Matthew McConaughey in a short but memorable cameo as his mentor. Loud, flashy and totally obscene, “The Wolf of Wall Street” is like a private tour through Belfort’s wildly excessive lifestyle. But while the movie may resemble a 1990s version of “Scarface” at times (it’s certainly easy to see why his employees treated him like a god), Scorsese doesn’t shy away from revealing some of his protagonist’s less proud moments as well, like his crazy misadventures while hopped up on Quaaludes. The scene where Jordan and Donnie trip on a highly potent strain of the drug is easily one of the funniest sequences of the year, and a perfect example of the kind of comedy present in Terrence Winter’s hilarious script. The only major problem is the movie’s 179-minute runtime, because although Scorsese keeps things moving at a really good pace, it’s a little too long for its own good. Still, the characters are so magnetic, the story so incredible, and the dialogue so fast and funny that “The Wolf of Wall Street” is hard not to enjoy. It’s Scorsese’s best film in years, and one that will only get better with time.